This deck is awesome. 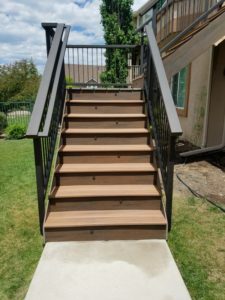 The Trex decking is installed with two different colors to give variety and accent. 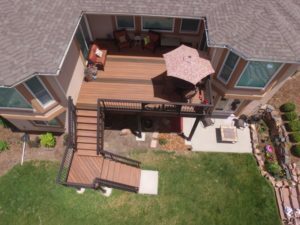 Trex Transcend decking is beautiful with wood grain and variety of color in the decking. 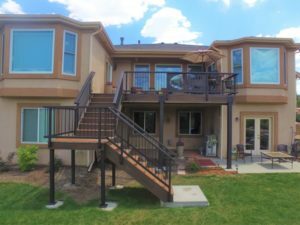 The patio below the deck is protected with Trex Rain Escape so the owners can enjoy the outdoors with protection from the elements year round. 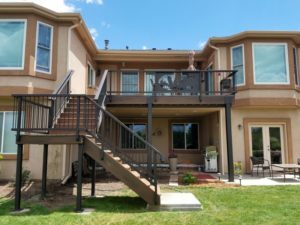 The custom handrail is a final touch to this deck. 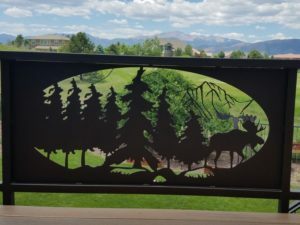 The metal railing is a larger rail with 2x4 top rail, 2x2 bottom rail, but the glory of the rail is the wildlife scene featuring a moose. It is powder coated in Oil Rubbed Bronze for a long lasting finish. 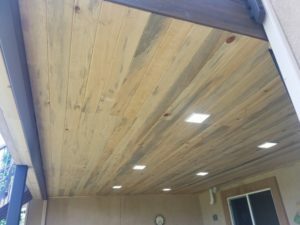 The trex lighting on the stairs and the LED can lights finishes this deck.